Open source automation server that offers a lot of plugins for software building, testing, and deployment. that can achieve continuous integration. It supports wide range of the operating system like UNIX,LINUX,Windows,etc. Good thing is it is open source and can we used with wide range of the major tools like CVS,GIT,ANT,Maven etc. Jenkins is easy to use and is very flexible. In jenkins we can integrate large number of the servers as a result team across the world can work continuously integrating the project.Jenkins helps the developers in customizing the tool.In all most all the enterprise applications these Jenkins are used as a main tool for the continuous build and integration tool. Overall: We can solve one of the major problems of the deployments as Jenkins can take of our major continuous build and integration process and it is widely used in all the major and minor enterprise applications and the Jenkins source code is very free and is flexible and can be used in almost all the operating system. A open source automation for continuous integration and delivery. Pros: Jenkins is one of the best automation tool for deployment. It's easy to configure and maintain. The Jenkins implementation don't need large code based enchantment to configure and implement it which makes it easy to opt. The build pipeline is easy to manage with it. Jenkins helps in boosting the agile process with automation which helps in speeding the delivery of the product. Jobs are easy to configure the build and deploy the code on multiple servers at once. Various third party pulgins give the wings to it. The large plugin community and easy plugin development make the process easy. Cons: Jenkins jobs configuration wizard should be more enhanced and should come with some more features which help to setup the jobs faster. Jenkins should also increase the documentation on the plugins development. Before updating Jenkins we always need to check its compatibility with the other plugins we are working with, this process should be simple. Overall: Jenkins helps us in doing the deployment for the 500+ clients server in just few hours but before it would take weeks to do the same. Best thing in it the container can be also helpful in case we need the immediate rollback. Orchestration help to achieve the continuous integration and delivery. Pros: Rich set of functions that allow to schedule different software processes execution. Even more rich choice of plugins an ease to develop own plugin. We use Jenkins to streamline software we develop releases. We have changes signed daily for release and this is where Jenkins pipelines come to the stage. Cons: Not much options available for making backups. the error was that Jenkins can no longer read job configs of older format (while we expected it converts all jobs automatically). As a result we need to perform a piece of manual work to perform an upgrade. 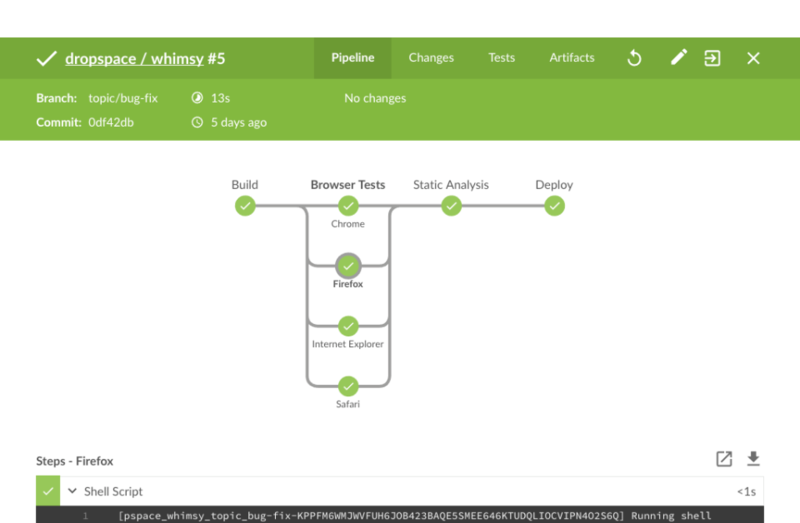 Overall: We visualized and streamlined our software release process thanks to Jenkins pipelines. Jenkins - A robust way to automate your jobs. Pros: Jenkins is an open source automation server that help in pure automation with continuous integration and help in fast delivery of the product. It is highly recommended with Java language application as it itself writing in it. The numbers of plugins make this tool special. We can also configure the mail notification on different events like build failed and unstable build. The best thing in it is easy to configure with the help of web interface where we can check the errors and other important notifications. The integration of Jenkins help in to deliver the product with CI/CD model. Cons: Jenkins should come with the in-build backup option and I always keep missing it and adding the other third party software to keep maintain the backup before deployment. Multiple Jenkins jobs do need to setup in case of multiple language application is used by the product. Overall: Jenkins make our life easy with removing the risk of manual errors and help in speeding the process. The Jenkins community is the best one stop place where you can discuss the stuff and get the solution. Once you adopt it you will surely feel the difference with the quality and fast delivery of the product. Pros: > Easy to install, easy setup, open source. > Supports Maven build, Gradle build, Wrappers. > Can schedule daily jobs to run automatically. > Good set of plugins. > Clone jenkins setup option is there. Cons: > Doesn't support multiple apps to be selected and deploy one after other automatically, have to select and deploy each app individually, explicitly using for loop and delimiter we can make it work like that but if any plugin is there, that would be much helpful. > Sometimes plugin becomes too confusing to use, as with the same name have multiple plugins, should have proper documentation on what does what plugin do. Overall: Build and Deployment are handled using Jenkins. Our daily automation suite run over jenkins. Pros: I like that it keeps a log of all of your previously made jobs on disk. This makes it so that not only do you keep old builds themselves, but also their outputs right within the ui. This makes debugging why a build failed pretty instant so long as you can get onto your jenkins instance relatively simply. Cons: The UI itself is disorienting sometimes and the plugin landscape, while vast, has a very high amount of variance when it comes to helpful text. You either know exactly what a particular tool does or you don't. I've found the help text particularly unhelpful for most things I did not know 100% about initially. So basically, sensible defaults for things would help, but this is less on Jenkins core product and more about its community. Pros: What I like about Jenknins is it's plugin support, modularity and weekly builds, which means Jenkins is constantly developed and improved . There is plenty of plugins available, which make it easy to integrate with various build servers and cloud solutions, different reporting tools and so on. I'm using it for test automation tasks (together with Ranorex) and it's quite reliable solution. Cons: Jenkins can be quite hard to setup for a man with previous experience with it. But there are many nice and easy to follow tutorials. Jinkins is tool which helps user to integrate and deploy code on different different server. Pros: I use Jenkins as a java developer.what I like in jenkins is a user can make a script and can use same script to build your code.You can immediate find if there is any issue with build. It will send notification to whole team regarding build failure so there is no need to directly do changes in Application. by build failure itself you can do your code testing .Most important thing is you can build and deploy code on time basis so automatic it will build at that time. Overall: it is over all good experience . Pros: Jenkins can be set up to automatically run a build of your software every time someone commits code to the repository. This means that if someone commits code that breaks the build, Jenkins will very quickly find out. Jenkins can also be set up to send an email with the latest commit message as well as a stack trace whenever the build breaks. This allows a team to know immediately when a commit breaks the build. Cons: Setting up Jenkins to successfully run your software's build including getting all of your software's dependencies can be difficult sometimes. However, many people use Jenkins so there is a plethora of information available to help with setup. Overall: Immediate feedback on your software's build status can allow developers to quickly debug and fix any build issues that your software has. Pros: One of the most powerful tools to manage your build and deployment. It has 'n' number of features and advantages which makes a developer life easy. Pipeline jobs, creating multiple jobs, dependent jobs, parameterizing jobs, scheduling jobs, coupling two jobs together and so many more features. Cons: There are plugins for almost everything, but the plugins are somewhat not safe. It might compromises the security. Not everyone prefers having plugin. Overall: I am using it for CI/CD purpose. We have created different stages in pipeline job to install product, update product, uninstall product, re-install product. Pros: The ease with which we can use this for team builds. The features which can be included is really great and the results are wonderful. We can configure a lot of things with Jenkins and it's really good. Cons: One of the major negative points of Jenkins is scenarios when the build fails sometimes and the exact reason becomes unknown. We had to trigger build manually again and the build goes fine. So sometimes build issues are there. Overall: The main benefit is build management. But apart from this main functionality, we were able to integrate many third party application and features as well which are quite useful. Pros: Jenkins is one of the leading software that enables me to automate part of my job, I can creating scripts using Jenkins to creating folder and set config setting in order to update a release version of our application. With Jenkins I am able to set certain parameters to using specific plug-in that work with a configuration setting that i need to do. Moreover, with Jenkins The installations is super easy there is no need to configure my PC to a certain setting for Jenkins, i just install the software and let it do its own thing. The continuous delivery gives me the ability to create extensive projects that can automate part of my job. Cons: Not enough Documentation when I need help with a particular plug-in installation. Jenkins does not provide a clear instructions on functionality of a plug-in and sometimes i get stuck with it. Pros: Jenkins is one of the most preferred automation server in the software development world. The ability to schedule jobs on the go for your software build makes it very handy. It's easy integration with Sonar helps you determine your code quality and performance every time you run a job, making it very very useful for developers. Cons: The only con is the time required to create a job. But once that's done, it's a cake walk from there on. Overall: Jenkins is highly recommended from my side. It decreases the risks of manual build and helps in maintaining the code quality. Pros: Jenkins new Blue Ocean features are amazing for working with CICD pipelines. In addition, the pipeline declarative syntax that allows you to define the entire build process in a Jenkinsfile within your code case so that you do not have to manually create jobs from the Jenkins UI is amazing. Cons: From an administration perspective, sometimes Jenkins can be fickle and difficult to troubleshoot. Luckily there is an enormous community of users so usually a good google search can help get us back on track. Cons: There is a small curve of learning how to configure jobs and agent machines. Overall: Jenkins is an integral part of our testing environment. Jenkins is the hub that connects our dev code to test machines and devices. It enables us to seamlessly deliver code that automatically triggers build jobs which then trigger test jobs. The number of man hours saved is immeasurable at this point. If you aren't using Jenkins in the testing world, you need to start - even if automated testing is not in your ecosystem yet. Pros: It has good integration with just about every DevOps tool I've known. It's easy to set up and configure. The logs and system reviews are extremely thorough. Overall: Daily automated tasks no longer take up much time. Just review the results and see what happened. Pros: Extremely easy to integrate into our code bases. Helps us ease up tedious tasks. For instance, we've set up a job that'll allow certain people to ask Jenkins to cherry pick one or a list of Git commits from one release into another. Jenkins will cleanly apply the task and run all the required test cases prior to merging into master. Cons: Mostly issues with the website. It sometimes locks me out for no reason or mistreat my permissions. Pros: 1. It's a most powerful CI tool used now a day's. 2. We can execute our development and automation jobs very smoothly and can share reports among the team member. 3. It's a good quality product used by developer, automation engineer and devops team members. Cons: 1. It's a bit complex for a naive user to understand console error. 2. We should have few prior technical knowledge to understand job configuration part. Overall: I am pretty much happy to work with it. Jenkins is easy and configurable CI server/tool for Continue integration and Continues development. Pros: It is very simple and straightforward, provides built in help for error checks. proper guideline and steps for step by step configuration . Support rich set of plugins likes 1).Job configuration history plugin which allow you to keep history or previous build. 2)Post build task which help to perform a task after the build. 3)Github pull request builders this is the best plugin which provide support for automatic code review. Cons: Configuration guide line is base on command line argument so it difficult to understand. It taking too long time to build when your project contain number of forms and test cases. in our product it is taking more than 1 hrs. It is open source you not getting proper support. Sometime its not taking latest committed changes need to run 2 or 3 times. Pros: It is extremely simple to setup. Press a button and it builds! It builds our software and runs all unit tests and regression tests so that we know if a production executable works before we deploy it live. Cons: Sometimes, our builds get stuck, and Jenkins wastes a few hours doing nothing and blocking future builds from happening. Basically, it doesn't know the difference between stuck and slow builds. Best build automation and continous delivery software on the planet! Pros: Tons of features and community support. I almost have to ask myself what can I not do with Jenkins when it comes to supporting delivering software. Every problem I have faced so far in constructing a continuous delivery process, Jenkins has been able to meet it. Cons: Features can be almost overwhelming and some of the plugins have not caught up to the new pipeline model of delivery. Cons: Sometimes it gets slow with multiple apps building up it and gets mysterious with apps builds on one mode and fails on other node. Pros: Lots of plugins make extending Jenkins a possibility, large community to draw from in terms of technical blogs and how-tos. Cons: Plugins can easily conflict with each other, or be incompatible with newer jenkins versions, leading to risky upgrades, and infrastructure "rot". Hard to debug core Jenkins issues, and sometimes bug reports about core issues have been reported years ago with no fixes. Cons: Got pipeline you need to have basic knowledge of groovy script. Overall: Overall this is very good tool to orchestration purpose. Pros: Jenkins is free open source software designed for aiding with continuous integration. Jenkins can literally run all your integrated tests for your code while your coding. As long as your developers are building unit testing and/or integration tests for their code there is a huge advantage to using Jenkins. Cons: With most open source software made by the great minds of the world, always a tons of options with a learning curve. Also, not the slickest and most amazing user interface. Overall: Automation for unit testing, integration testing. This is the coolest thing for me, having my test run automatically. I could build my test before I code and start writing until Jenkins gives me the green light that all is good. Pros: 1. Its most useful CI tools used now a days. 2. We can create jobs for development and automation. 3. We can execute our jobs irrespective of time and also execute code on virtual machines or sauce labs. Overall: I use this app in my automation project and I am pretty much happy to use this application. Pros: For a free solution it really is the most robust goto solution we have found. There is a huge plugin network to do exactly what you want and what you need. Cons: The only problem that we have encountered is that the update does not always pull from the stable release, leading to broken environments. Beware before doing the auto update. Pros: The software is highly open source and has a rich community that generate plugins. Cons: Since the community is generating a lot of plugin, quality of these plugins is variable. There is a lot of missing native support for trivial items that requires plugins to be able to work. Pros: The way the given the application to configure in our machines is very very easy installation and the way of using the application for the build purpose of daily crone Jobs is awesome . Cons: Can be improved UI little more for Help and Support section . Overall: We are extensively using Jenkins to run our nightly automated test and it works perfectly fine. Jenkins makes the Continous Integration happens! Pros: Free Continous Integration / Continous Delivery tool. Really intuitive to configure a biuld and deploy plan. Shows reports of the progress of the project. Supports branchs execution, sends notifications, etc. Cons: Could be hard to understand for begginers, but it's a tool that has everithing that is needed for Continous Integration / Continous Delivery. Overall: Know that a biuld is broken, avoid integrations of failing biulds to the main branch. Reports allow to understand the progress of the project. Jenkins is a well thought out Continuous Integration / Continuous Deploy system. Pros: Jenkins has a lot of people who use it and have no problem letting everyone know how they performed their tasks. The CloudBees company, the support company of Jenkins, is dedicated to the success of Jenkins. It has anumber of nice plug-ins that allow a developer to use PowerShell and other scripting environments. Cons: Jenkins is very Java centric. If you do not know Java you find Jenkins a bit difficult to start using. It uses Groovy as its primary scripting language, which is a Java based scripting language. Overall: My company is able to build, test and deploy our applications as we move forward into the DevOps methods of building software. Cons: maybe too flexible. You can get lost easily. It is built on java which is not a very simple programming language - so making plugins can be a bit painful. Overall: increasing deployment speed by a lot. Pros: Jenkins is the most powerful automation tool for code deployement. You can write shell scripts in jenkins to run on servers when someone pushed code on your repository. Its customization and flexibility is awsome. Cons: Being a java based tool, you need a stable server to host jenkins. Pros: * Very useful for developer as well as tester to debugging their code. * It saves lot of time for developer. * Easy to deploy the software using jenkins. Cons: * I feel Installation and setup is little bit tricky. * Make it more easy to setup all the environments. Cons: we have several jenkins machines. the old versions are buggy and sometimes not stable. Used this application to schedule nightly tests and regression test suites. Scheduling builds and sending emails. Monitoring the output with the console and troubleshooting. Cons: The user friendliness and easy to use and do the configurations in an easy way.And better if we can get more support on how to use this tool. Pros: There is almost nothing you can't do with jenkins, so many plugins, you can write your own code, your imagination (and coding skill) is basically the limit. Overall: We were able to save some days of work with just an easy setup and are working on more complex one which will save even more. Highly recomend it! Pros: very powerful tool! very flexible and stable. help coordinate between several third party tolls & run our entire CI\Cd\DevOps in the company. Cons: The interface is difficult to use, could use better UI. Overall: Powerful tool. not easy to use out of the box. Pros: We use this to streamline our deployments after new merges and finishing builds. Can take sometime to learn how to use. Cons: Can be difficult to navigate but I have been able to get to what I need as a developer for finding error messages. Pros: Jenkins is easy to set up, it's free, and has tons of plugins. It's almost all customizable and can fit your need for a CI server. Cons: The only issue I've come across is updating plugins and versions of Jenkins itself can become cumbersome. Cons: Plugin dependencies can be very cumbersome at times. Pros: We've have been using Jenkins for the last few years and it has been key to the success of our software development process. A must-have. Cons: We've experienced issues when upgrading Jenkins, as the process is not intuitive. Pros: Jenkins is an automation server software that is used frequently to achieve continuous integration and delivery in software projects. It is open source and free and comes with a wide range of plugins. It is is flexible and easy to use. Cons: Lack of governance, Lack of analytics. Managing a Jenkins server needs special attention and many times, a dedicated developer. Pros: It's pretty straightforward to use, has good integrations with slack & it's easy to setup chains of events between builds/deployments. Cons: The UI can be un-intuitive, and feels outdated. The concept of logged in versus logged out is not very apparent to the user, so you might feel like you don't have certain features that you should, but really you just need to log in.